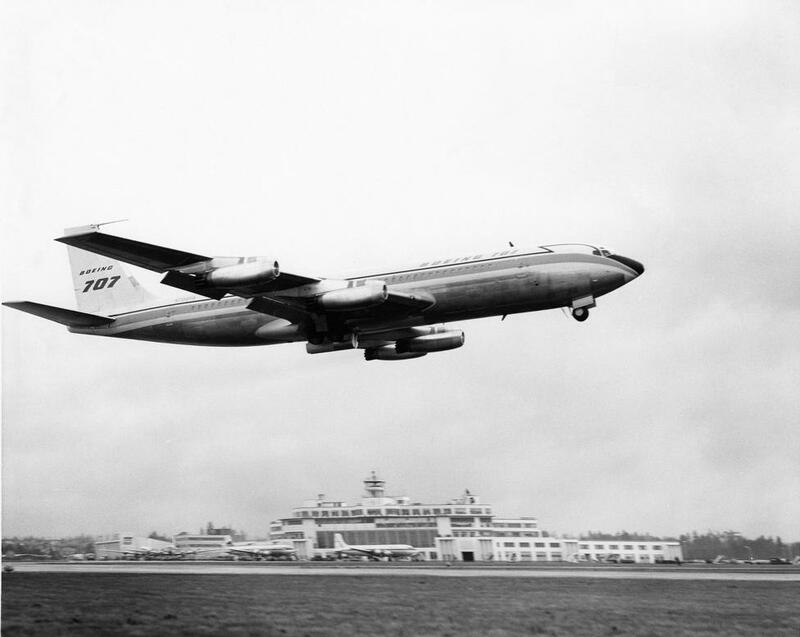 20 December 1957: The first production Boeing 707 jet-powered commercial airliner, N708PA, made its first flight at Renton, Washington. 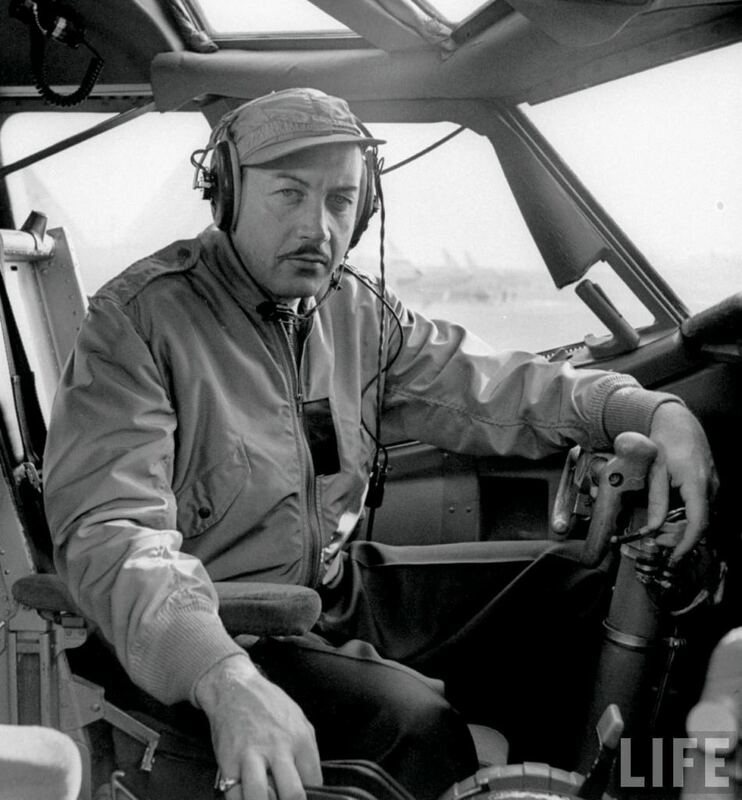 Alvin M. “Tex” Johnston, Boeing’s Chief of Flight Test, was in command, with co-pilot James R. Gannet and flight engineer Tom Layne. Takeoff was at 12:30 p.m., PST. Poor weather limited the first flight to just 7 minutes. The new airliner landed at Boeing Field. Later that day, a second flight was made, this time with a duration of 1 hour, 11 minutes. N708PA (Serial Number 17586, Line Number 1) was a Model 707-121. The new airliner had been sold to Pan American World Airways, the launch customer, as part of an order for twenty 707s in October 1955. The Boeing Model 707 was developed from the earlier Model 367–80, the “Dash Eighty,” prototype for an air-refueling tanker which would become the KC-135A Stratotanker. 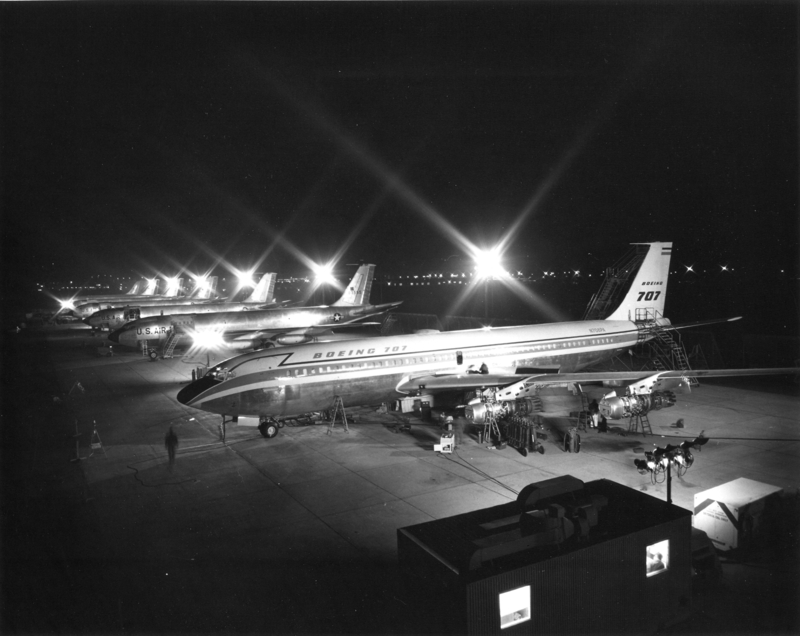 The 707 was a four-engine jet transport with swept wings and tail surfaces. The leading edge of the wings were swept at a 35° angle. N708PA was initially used for flight testing by Boeing. Once this was completed, it was prepared for commercial service and delivered to Pan American at San Francisco International Airport (SFO), 30 November 1958. Pan Am named the new airliner Clipper Constitution. In February 1965, the airliner was upgraded to 707-121B standards, which replaced the original turbojet engines with quieter, more efficient Pratt & Whitney JT3D-1 turbofan engines which produced 17,000 pounds of thrust. The wing inboard leading edges were modified to the design of the Model 720 and there was a longer horizontal tail plane. Clipper Constitution flew for Pan Am for nearly seven years, until 17 September 1965 when it crashed into Chances Peak, a 3,002 foot (915 meters) volcano on the Caribbean island of Montserrat. The point impact was 242 feet (74 meters) below the summit. All aboard, a crew of 9 and 21 passengers, were killed. 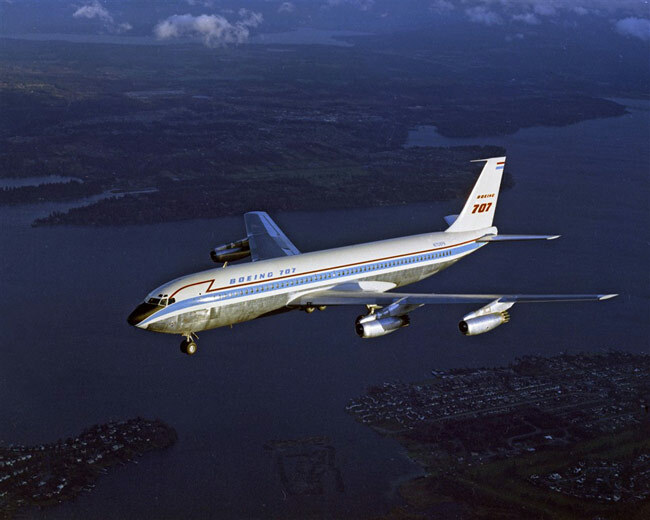 The Boeing Model 707-121 was a four-engine jet transport with swept wings and tail surfaces. The leading edge of the wings were swept at a 35° angle. The airliner had a flight crew of four: pilot, co-pilot, navigator and flight engineer. The 707-121 was 145 feet, 1 inch (44.221 meters) long with a wing span of 130 feet, 10 inches (39.878 meters). The top of the vertical fin stood 42 feet, 5 inches (12.929 meters) high. The 707 pre-dated the ”wide-body” airliners, having a fuselage width of 12 feet, 4 inches (3.759 meters). The airliner’s empty weight is 122,533 pounds (55,580 kilograms). Maximum take off weight is 257,000 pounds (116,573 kilograms). The first versions were powered by four Pratt & Whitney Turbo Wasp JT3C-6 turbojet engines, producing 11,200 pounds of thrust (49,820 kilonewtons), and 13,500 pounds (60.051 kilonewtons) with water injection. This engine was a civil variant of the military J57 series. It was a two-spool axial-flow turbojet engine with a 16-stage compressor and 2 stage turbine. The JT3C-6 was 11 feet, 6.6 inches (3.520 meters) long, 3 feet, 2.9 inches (0.988 meters) in diameter, and weighed 4,235 pounds (1,921 kilograms). At MTOW, the 707 required 11,000 feet (3,352.8 meters) of runway to take off. 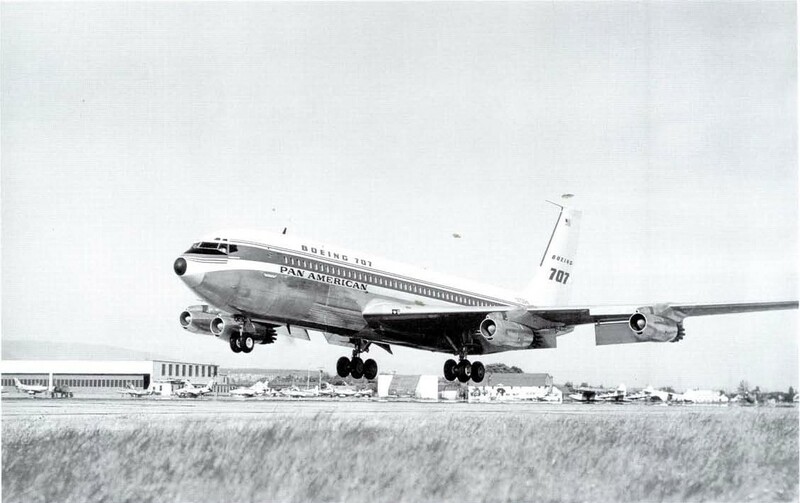 The 707-121 had a maximum speed of 540 knots (1,000 kilometers per hour). It’s range was 2,800 nautical miles (5,186 kilometers). 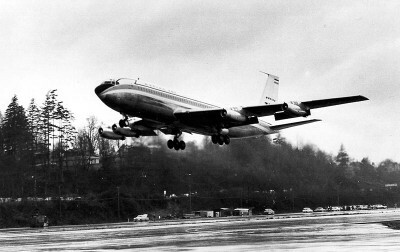 The Boeing 707 was in production from 1958 to 1979. 1,010 were built. Production of 707 airframes continued at Renton until the final one was completed in April 1991. As of 2011, 43 707s were still in service. Thank you for again showing me something I did not know. Always knew statue miles to kilometers, MPH to KM/H, KTS to MPH. Now I get KTS to KM/H. Amazing that as a military pilot I didn’t need to know that, maybe I depended on my ‘wiz wheel’ to much? Or maybe the add on the military radio station in Saudi during Desert Shield/Storm that played literally 6 times an hour with a corny story about a KM being .62 miles. You never stop learning if you want to. John, one of the most—oh, I don’t know—confusing??? things in Aviation is all the different speed units. For the longest time, U.S. aircraft airspeed indicators were calibrated in statute miles per hour, but later this changed to nautical miles per hour (“knots”). Although the Metric system seems to be popular worldwide, it seems that not that many ASIs are calibrated in km/h. (I’m looking at a photo of a MiG 29 cockpit right now, and the ASI is labeled METRIC.) But then there is Airspeed, True Airspeed (TAS), Indicated Airspeed (IAS), Calibrated Airspeed (CAS), Equivalent Airspeed (EAS), Knots True Airspeed (KTAS), KIAS, KCAS, etc., etc., etc. And then we have Ground Speed, Mach Number, and all of those V speeds. Aviation weather reports give visibility in statute miles, but wind speed in knots. With spacecraft, orbital speeds seem to be given in feet or meters per second, rather than units per hour. As a retired helicopter pilot, I am most accustomed to using mph, this ASIs on some aircraft I have flown had two scales, giving both IAS and KIAS. n February 1965, the airliner was upgraded to 707-121B standards, which replaced the original turbojet engines with quieter, more efficient Pratt & Whitney JT3D-1 turbofan engines which produced 17,000 pounds of thrust. The wing inboard leading edges were modified to the design of the Model 720 and there was a longer horizontal tail plane. Clipper Constitution flew for Pan Am for nearly 8 years, until 17 September 1965 when it crashed into Chances Peak, a 3,002 foot (915 meters) volcano on the Caribbean island of Montserrat. The point impact was 242 feet (74 meters) below the summit. All aboard, a crew of 9 and 21 passengers, were killed. Wouldn’t nearly 7 years be more accurate b/c it was delivered at the end of 1958? Yep. 6 yrs., 9 mos., 19 dys. Thanks.